Opal a gemstone known for many thousand years. Two rich civilizations contributed to the naming of opal. The Sanskrit word 'upala' means precious stones. The Greek word opallios means 'change of color', well representing the splendid color flashes and play of color that opal gemstones are known for. 'Opalus' was what the Romans called the opal gemstone. Ancient Greeks, Romans and even the Aztecs attached importance and high value to opal. The centuries old tradition of birthstones, assigned opal to be the birthstone for the month of October. All said and done, a mens opal wedding ring will surely be a memorable jewel. But before you rush to order an opal wedding ring, let us first study the options available. In this report you will also learn some essential elements about opal gemstones. Armed with this information, you will be in a strong position to make the right selection for your mens opal wedding ring. In this section let us talk about opal 'varieties'. This is something that is very relevant when choosing the right opal for your mens ring. The information is clear, precise and straightforward, no intention to push a sale is made. Precious Opals: An interesting and sometimes confusing jargon used to describe some opal gemstones. A natural opal that shows color flashes and play of color, is referred to as a precious opal gemstone. Keep in mind that there are some opal gems like, green opals and even fire opals that are not supposed to flash any color play phenomenon. These are valuable opals and can be high dollar items however, they will not be classified as precious opals since they do not show the color play effect. So if you have a mens opal wedding ring with a fine, fire opal gem from Mexico, you would pay quite a bit for the gem but, gemological definition would refrain from calling that a precious opal! Solid Opals: Read this definition carefully, it explains what exactly is meant by a solid opal. A natural opal that is cut and polished from one single piece of opal gem is defined as a solid opal. Before you jump to the conclusion that a solid opal is best for a mens opal gemstone ring, let us hear the other side of the story. Advocates of opal triplets and doublets have their own logical explanation for recommending these gems. We will get into opal doublets and opal triplet discussions lower down in this report but, here is a short explanation. Both opal doublets and triplets are assembled gems, a doublet consists of two layers and a triplet is made up of three layers. You surely could not call these solid opals but, the fabrication of such gems does serve to increase the toughness of the stone. This will be better understood once you read the paragraph related to the durability of opal gems. Doublets and Triplets: An opal doublet is an assembled gem where, a piece of natural opal gem is bonded on a dark (generally) base. The lower portion of the opal doublet could be a black onyx or other material. To make an opal triplet, a thin slice of natural opal is bonded between two layers. The top is conventionally composed of a piece of white topaz or natural crystal quartz. The base material is similar to that used to make an opal doublet. In commercial production today, the base or even the top of the triplet are generally made from high quality manufactured glass. However, if you choose to have a mens opal ring with one of these gems, you can make a specific request for the strict use of natural stones, to form the base and or the top layer of the assembled opal. It is important to pick a piece of natural opal that has color flashes and transluscence, to form an opal doublet or triplet. The dark base, provides a very suitable background for the play of color display. There is also no doubt, that the overall toughness of the opal gemstone is enhanced when it is assembled into a doublet or triplet. You know the environments in which you would be wearing your mens opal wedding ring, decide whether the added toughness is relevant to you. A high end custom jewelry provider can assemble an opal doublet or triplet just for you, this will ensure that quality materials are used for all components of the stone. A bezel setting is the best option for setting opal gems including, opal doublets and triplets. White Opals: One of the most popular gem for a mens opal wedding ring, white opals are generally expected to have color specks and color flashes clearly visible through the gemstone. While Australia remains the preferred choice for white opal gems, you can today choose from Ethiopian opals too. When it comes to our recommendation, we would suggest a mens opal wedding ring with a white Australian opal gemstone. While not all Ethiopian opals are unstable, some mines in the country do produce opals that not as durable as Australian opals. Our apologies to our competitors for dislcosing the truth but, there really is no point in witholding facts from the buyer. You might come across white opals that have absolutely no display of color flashes, most buyers do not prefer such white opal gems. An interesting thing about this opal is that, it is the most commonly selected opal gemstone to be made into a doublet. A dark base used on the white opal doublet, helps darken the background and this can significantly dramatise, the play of color phenomenon. As we had mentioned above, an opal doublet with it's backing gets a boost in terms of gem toughness too. Though going against, the recommendations of some gem purists, we would say that in terms durability and longterm stability, an opal doublet is suitable for a mens opal wedding ring. Black Opal: One of the most valuable and expensive opal varieties, black opal is extremely rare. The price gets even more stiff if, the gem is mined in the Lightning Ridge town of Australia. If you plan to get a wedding mens ring with black opal, ensure that you have a stacked a sufficient budget to get a good ring. A black opal gemstone is a natural opal that has a fairly dark background color. The color in reality could be dark grey, black or even dark brown. A black opal gemstone that combines a dark background with, moderate to high play of color, looks truly amazing and will have a substantially high price point. The price of your black opal wedding ring would depend on the, origin of the gemstone, the degree of color contrast between the color flashes and the background and also on the size of the gemstone. Just to give you an idea of the price, a mens gold black opal ring with a gem size of around 12x10mm oval, a moderate but clearly visible color play effect and of Australian origin would cost you around - 4,000 U.S$ to 6,000 U.S$. This estimate includes a substantial gold weight of around 20 to 30 grams. We kept talking about black opal gems with an Australian origin, this obviously implies that such opal gems can be found in other countries too. Yes, you can find Ethiopian gems with a dark brown or near black color quite easily. Generally these gems are much cheaper than Australian opals but, stability is a bit dicey because not all Ethiopian mines yield stable opal gems. If you cannot budget for a fine black opal gemstone mens wedding ring, consider the option of an opal doublet explained above. A fairly transluscent white opal gems with a color play effect, can be mounted on a piece of black opal or boulder rock. This will significantly darken the background of the gem and increase the play-of-color effect. Fire Opal: This is a stunning option for a mens wedding opal gemstone ring, it is also one of the very few opal varieties that can be found with an impressive degree of transparency. The fact that not many people are aware of this amazing opal gem, makes it even more desirable. A fire opal mens wedding ring would ideally have a Mexican fire opal gemstone. Though Mexican fire opals are not as easily found as a decade ago, you can still insist on such an opal for your mens opal wedding ring. You might hear of Brazilian and Ethiopian fire opal these days but, Mexico remains the preferred source. The gem gets it's name from it's color that can remind you of fire and flames. While most men would prefer the darker reddish-orange color fire opal for their mens opal wedding ring, you can also choose a brighter shade of orange. Keep in mind that the deeper the color of a fire opal, the lower it's transparency - this is almost always true. If you plan to get a fire opal mens wedding ring, it is always good to broadly agree on the color of the gem before confirming the order. Keep in mind that fire opals can sometimes have a pale yellow to a bright yellow color. Unless you specifically want such a color, make sure that your jeweler understands that you do not prefer that fire opal color. The most important thing about fire opal gems is that, they are generally cut with facets, a rarity for most opals. The possibility of getting a faceted opal for your mens wedding ring, increases the design concepts that you can choose for the jewel. The above opal 'types' cover almost all the options that you have for choosing the gemstone for mens opal wedding rings. We will now say something about the features and properties of opals that, will influence the way you need to wear and care for your mens wedding opal gemstone ring. These will be covered in the paragraphs related to opal durability and caring for opals. Opal Durability: We mentioned abve about opal doublets and triplets enhancing the toughness of an opal gemstone, all that information will start making better sense after you have ready and understood this paragraph. On the Mohs scale that rates gem hardness from 1(minimum) to 10(maximum), opals come up to a 5.5-6. Since the hardness of opals is not truly impressive, you need to keep this in mind when handling and wearing a mens opal wedding ring. Physical impact can damage an opal, this needs to be addressed when wearing or storing opal gemstone jewelry. Another interesting and important feature of opals relates to the moisture content of the gem. The mass of an opal gemstone has a 5% to 8% moisture content, this is a natural occurence. The beauty of the opal gem relies on the presence of this moisture. Chemicals and heat can either dry up or negatively impact the moisture content of opals, this obviously does negative things to the beauty of the gemstone. This information is relevant to your mens opal wedding ring. With this knowledge you would agree that, an assembled opal gem in the form of a doublet or triplet does add to the durability of the gemstone. Caring For Opals: If you have read this report on opal wedding rings for men so far, the issues related to caring for opals would be easy to understand. Let us quickly summarize this topic right here. Since opals have and require their natural moisture content to be intact, you should avoid things or environments that can damage or dry up the moisture. Do not expose your mens opal wedding ring to strong heat, keep this in mind when storing your opal gemstone ring too. Chemicals and even strong detergents can also damage the moisture balance and composition in the opal, this could make your opal quite dull. Since the hardness of opal gemstones is not very high, physical impact can damage the gemstone. You obviously do not want your opal wedding ring to hit against something hard. Take the ring off and keep it in a safe please, if you plan to do something that involves a lot of physical activity - like cleaning the garden, repairing the car, playing a game of tennis etc. Cleaning Opal Gems: No matter how well you look after your mens opal wedding ring, the jewel will need to be cleaned ocassionally. While you could take it to a professional jeweler to get the job done, general cleaning is something that you could do on your own. What you should be using to clean an opal ring is some clean water at room tempertature, a clean and very soft toothbrush, a clean ceramic or glass bowl and a piece of clean and soft cloth. Pour the water in the bowl, and place your opal mens wedding ring in it. You can leave it there for around 4 to minutes. Then carefully lift the opal ring from the water making sure that, it does not strike the bowl. Inspect the portion under the opal gemstone. Any dust or soap that might be stuck there can be gently brushed away using the soft toothbrush. Do this very gently making sure that you do not hit the brush too hard against the stone, you should be using only the bristles of the brush to accomplish this task. Once again dip the ring in the bowl of water for around half a minute, the ring should be clean and bright now. If you must use a polishing solution or lotion to brighten up the metal mount of the opal ring, we would recommend using the polishing fabrics that are specifically made to polish jewelry. Since there is no spray, powder or paste involved when using the fabric, it is possible to try and keep the fabric away from the opal gem. In any case, it is a good idea to rinse the ring in clean water after the polishing task is completed. This will take off any chemical residue that might be stuck to the opal or the metal. Our Opal Rings: For those of who who wish to discuss any gem or jewelry requirements with our team, here is a brief note on our activities. We custom make all types of jewelry in gold or 925 sterling silver, the design, dimensions, metal and gemstones for your jewelry can be decided by you. You could send us your design concept idea to be used to custom make your opal wedding ring for you. We can also base the design for your opal ring on any of our existing jewels and then, customize it to include all your preferences. Do not be in a rush to mak a purchase from us, we would suggest that you discuss your requirements with our team at sales@kaisilver.com Once you have all the answers and clarifications to your queries, look at other options and make comparisons. At that moment, review the jeweler and choose one who you feel is the best for your requirement. This fire opal ring is an impressive choice for a mens opal wedding ring. 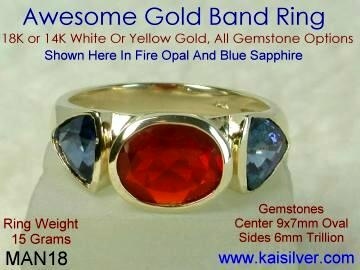 We can custom make all jewelry in gold or 925 sterling silver with gemstones of your choice. White opal, black opal, opal doublets and opal triplets are some options that you can consider for your mens opal gemstone wedding ring. Full details on this amazing mens opal ring can be reviewed ... here.